This RoadPro Thermoelectric Cooler/Warmer makes a great travel buddy. Plugging directly into the 12 volt outlet in your vehicle, contents stay cool or warm with the flip of a switch. Hey You - Stay out of the drive-thru. Take along a healthy sandwich, fruit and drinks. Avoid the time, cost & greasy leftover trash from fast food. Clean-Up's a Snap. Simply wipe it out with a damp cloth (wrung out, not dripping) and then a dry cloth. Sure beats ice! 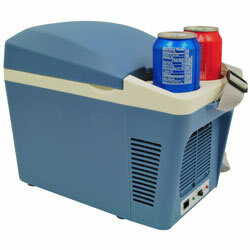 I've used my cooler all year taking the kids to soccer practice (2 kids, 2 practice times) without any problems. This keeps the sandwiches and drinks cool and not "soggy". They're happy and in turn - so am I. Thank you for all of your assistance, Tracy M.